When buying a car, make sure that you are not buying one with concealed accident or rust damage. 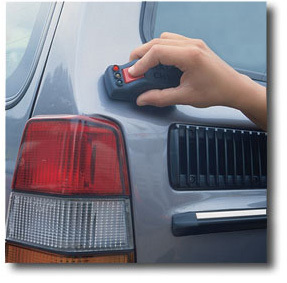 The Crash Check is the ideal car body checker. 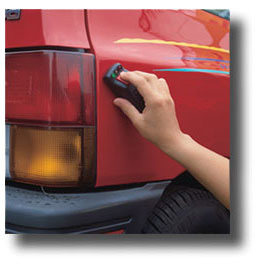 It is ingenious and easy to use. Simply check the paint thickness with the Crash Check. Those who have to repair damages caused by an accident, or hidden rust, have to apply thick layers of paint or body filler. The electronic-magnetic sensor in Crash Check quickly detects whether the coating on the sheet-steel body is thicker than it was in the original state. This way you can detect efforts to cover suspicious sections. Red indicates: WARNING! Severe irregularities in the car body, body filler, accident, rust! Crash Check Calibration and Accuracy Statement: Gauges for North America are set to go from Green to Yellow at the 5 mil mark. The Yellow to Red threshold is at the 17 mil mark. Tolerance for this gage is ±1 mil (0.001”). 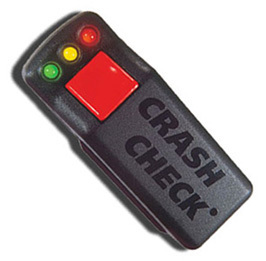 Place the Crash Check on the surface of the body and press the test button. The electromagnetic sensor shows you coating and subsurface condition at a glance. 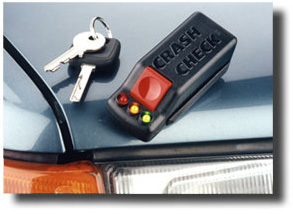 Who benefits by using the Crash Check?